Trump's Bureau of Land Management is rapidly opening previously off-limits areas to oil and gas drilling. Interior Secretary Ryan Zinke gives a speech before President Trump arrives at the Rotunda of the Utah State Capitol on December 4, 2017. From his living room window, Herm Hoops has an unobstructed view of Split Mountain, a jagged ridgeline that looms over the banks of the Green River in the center of Utah’s Dinosaur National Monument. Founded in 1915, the monument is known for its river rafting—the name Split Mt. comes from the fact that the river slices the pale pink and straw-colored sandstone peak in half—and for the fossilized dinosaur remains that can still be seen in an exhibit hall where they were originally unearthed. Hoops first visited in 1972, when he was in his late twenties; he camped at Echo Park, a verdant canyon not far from where the Green and Yampa rivers meet, as the sun was setting. Hoops says he’d never seen such a beautiful place. “The sun was hitting the rocks and I wanted to die right then and there,” he told me. On December 12, the Bureau of Land Management will auction off more than 66,000 acres in Utah for oil and gas drilling. One potential drilling site is on the edge of a wildlife refuge that provides critical habitat to an endangered fish species of the Upper Colorado River basin. BLM is abandoning long-term management, or Master Leasing Plans, designed to balance development and conservation. Many changes are happening at the state or field office level where they are largely out of public view. The small city of Vernal, which lies just outside Dinosaur in northeastern Utah’s Uinta basin, offers an example of what much of the American West may look like after the Trump administration upends public land management plans. The BLM outpost there has a reputation for being one of the most industry-friendly field offices: At the height of the most recent drilling boom, from about 2008 to 2013, it processed more drilling permits than any other BLM office in the country. When I stopped by on a chilly morning in mid-November, Jerry Kenczka, the assistant field manager for land and minerals, proudly told me that Vernal has the “biggest oil and gas program in the state.” Over the last decade and a half the region has seen a nearly threefold increase in the number of oil and gas wells, most of them on public land. According to the Utah Division of Oil, Gas, and Mining there are currently more than 11,000 oil and gas wells in the Uinta basin and thousands more that could be drilled in the next five to ten years. Kenczka said industry is currently sitting on roughly 1,800 approved permits, with another 400 pending. Troy Lupcho, who runs a local bike shop and went to high school in the area, says that from above, the landscape around Vernal looks like it has been “carpet-bombed.” The air quality in and around the city has suffered dramatically from the recent energy development. Wintertime temperature inversions in the basin trap pollutants in a blanket-like haze at low elevations, frequently driving ozone levels above those of major urban areas. A spike in infant mortality and birth defects, most notably in 2013, prompted the state to conduct an epidemiological study. The TriCounty Health Department, which oversees northeastern Utah, confirmed the rise in deaths but said the cause remained unknown. What is clear is that oil and gas development is the overwhelming source of Vernal’s air pollution—one 2013 study found that drilling operations were responsible for 98 to 99 percent of all volatile organic compounds released in the basin. Last year the state recommended the region be designated as a “nonattainment area” for failing to meet federal air quality standards, which would require stringent pollution controls on any existing and future oil and gas operations. But under Scott Pruitt the Environmental Protection Agency has already missed an October 1 deadline for making such determinations. In a written statement an EPA spokesperson acknowledged that “the Basin has continued to experience high wintertime ozone events,” but said nonattainment designations have not been finalized. Pressed on whether a decision would be made and when, EPA declined to comment. On Monday, the American Lung Association and other public health and environmental organizations sued the EPA for failing to meet the October deadline. If current plans to develop thousands of new wells move forward, ozone levels in the Uinta basin could more than double as a result. Jenny Biggs is an elementary school teacher and whitewater river guide just outside of Vernal. She comes from a family of river guides, but like many families in Vernal, she also has ties to the oil and gas industry. Her father was an engineer in the oil fields and her little brother has followed in his footsteps. Biggs, who often speaks at city council meetings, argues for a balance—which in northeast Utah generally means accepting a certain level of oil and gas development. “I drive a truck,” Biggs said. “My boat’s made of plastic.” Nearly every local conservationist I spoke with prefaced their comments with some version of the fact that they were not opposed to oil and gas development; they just want to see it done in a responsible way. And that means preserving the few open spaces that remain. Biggs said that while the area south of Vernal where most of the drilling has occurred is mineral laden, it’s widely believed that the area north and east of the city, including Dinosaur, is less productive. It made sense to concentrate development where it was already occurring, while preserving the land near the monument for conservation and recreation. For the past eight years, BLM has largely adhered to such a vision, by setting aside much of the area around Dinosaur while the state office worked to draft a long-term management plan. Master Leasing Plans, as these documents are known, are designed to protect areas of high cultural or recreational value and to reduce conflict between various stakeholders by creating a framework for future development—the sort of balance that Biggs and others have advocated. The BLM began to use MLPs in 2010, after a controversial lease sale in the final month of the George W. Bush presidency prompted a wholesale rethinking of the way the bureau handles oil and gas leasing, especially in areas close to National Parks or in regions with public health concerns. Former Interior Secretary Sally Jewell described the collaborative process of developing MLPs, which involves input from industry and conservation groups, as a “model for how communities can work together to support thoughtful development while protecting world-class environmental, cultural and recreational resources.”Under this process, for the last seven years the area surrounding Dinosaur has been defacto off-limits; those parcels of land were “deferred” or temporarily set aside pending the completion of the planning agreement. 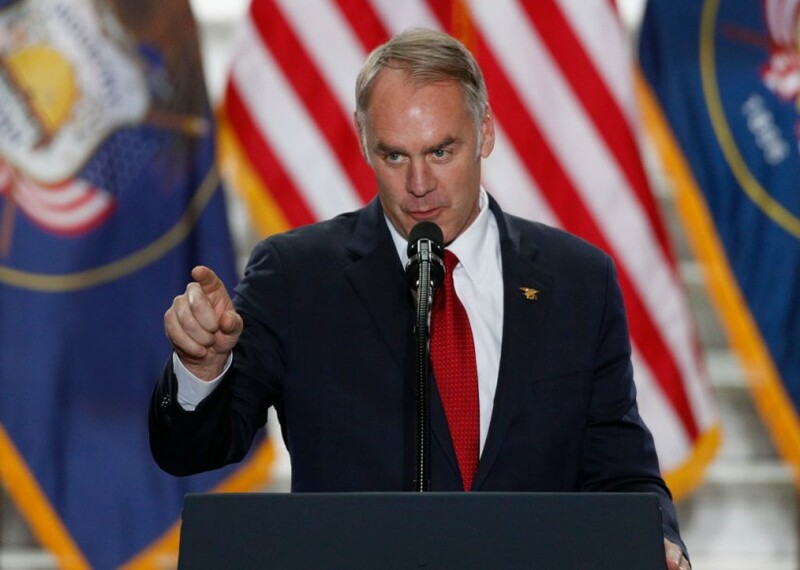 Under Secretary Ryan Zinke, DOI has said it will abandon MLPs, in part to avoid delaying oil and gas leasing in areas that were under consideration. According to an October report outlining “burdens” to energy production, the BLM is evaluating ongoing planning efforts “with the goal of ending this approach” in early 2018. But state offices have already removed restrictions on leasing in areas where MLPs were being drafted. According to a statement from the Utah BLM office, “We are asking our field offices to analyze the deferred parcels to determine if they are appropriate for leasing.” In other words, land near monuments and parks across the west that was previously set aside is once again being opened up to the prospect of oil and gas development. In Nevada, at least one field office has been stripped of its authority to defer leases in areas needing additional environmental analysis. Emails obtained through a FOIA request by the Western Watersheds Project reveal that the Tonopah field office was told in February to stop deferring parcels from lease sales altogether, and to no longer abide by a provision limiting surface-disturbing activities in critical habitat areas. These are some of the only tools BLM has to limit drilling in environmentally sensitive areas. A few months later, in a sale of nearly 200,000 acres overseen by the Tonopah office, not a single parcel was deferred. Citing pending litigation over that lease sale, the Nevada BLM office declined to comment on the policy change and whether it was a statewide directive. The Nevada BLM employee said the policy change had been relayed to all field offices. As sensitive lands are being auctioned off, standard environmental reviews are being short-circuited. BLM is required by law to consult with the Fish and Wildlife Service when drafting an oil and gas lease proposal. Then, FWS can either issue a letter of concurrence agreeing with BLM’s preliminary environmental analysis or conduct its own review, known as a biological opinion. This consultation between sister agencies is considered one of the pillars of the Endangered Species Act and is one of the few checks on BLM’s authority to lease public land. But DOI explicitly stated in its October report on barriers to energy development that the time and cost associated with these consultations are “unnecessarily burdensome,” and ordered FWS to streamline its efforts. The department has also mandated that environmental reviews be substantially shortened. In Utah and Nevada, conservation groups say that Fish and Wildlife is being pushed aside, and that endangered species act consultations are being politicized. In a letter regarding the Vernal sale, Utah’s FWS raised serious concerns about several parcels and the potential impact of a spill or accident on endangered fish and rare plants; they requested that one parcel be withdrawn from the lease sale altogether because it provides some of the only suitable nursery habitat for the endangered razorback sucker, a freshwater fish. According to a FWS employee who asked not to be identified, the letter was routed through Washington, DC and held up for months. The Utah FWS later attributed the delay to an “internal review process.” FWS’s recommendations were finally submitted on November 1, long after the public comment period had passed. A spokesperson for the Utah BLM office said that despite the delay the two agencies were communicating regularly during the review process and that the issues raised by FWS had been resolved. But the parcel in question will be included in the December 12 lease sale. When Jenny Biggs speaks at city council meetings, she makes the case that commercial white water rafting is just as integral to the local economy as oil and gas development. She points out that more than 300,000 tourists visited Dinosaur last year, generating millions in revenue for the region. But she also underscores the fact that people will only continue to come if the monument’s rivers and night skies remain untarnished. It’s not only the land near Dinosaur that could be profoundly altered in the coming years. Other parcels being offered as part of the December 12 lease sale would overlap with trails in the McCoy flats, a popular recreation area that the BLM includes on its list of the country’s top twenty mountain biking getaways. Lupcho, who built the trails with friends more than twenty years ago, says drilling could imperil what has become a thriving resource for the community. “If you destroy McCoy flats,” he told me, “bikers will not come to Vernal.” There’s a parcel along a scenic byway not far from Dinosaur that also happens to be situated between two state parks. And further west the bureau is putting up a block of 15 leases—about 35,000 acres—in the largely undeveloped San Rafael Swell, a region known for its prehistoric rock art and wild character.